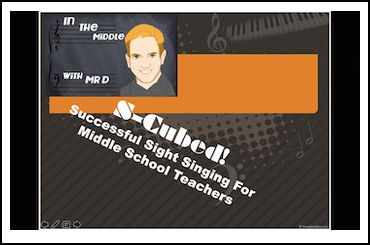 S-Cubed: Successful Sight Singing for Middle School Choir Teachers and Students is a course that was developed by Mr D during his 22 years of teaching chorus to this age group. Endorsed and used by the Choral program in Durham School of the Arts in Durham, NC, and programs around the world! Think of the S-Cubed Sight Singing system as a workshop-lesson plan combination that includes video teaching links and video teaching tip links to help buyers have at their fingertips many varied tools to help them teach sight singing to their middle school beginners successfully. Recognize what the children don't know. Don't fault them for not knowing it... Then, teach it to them in a fun way they will remember forever. ...That's the philosophy of S-Cubed. Click here to go to see a YouTube video explanation and read information about how and why S-Cubed were created. *Two videos of a choir that has been trained with S-Cubed as they sight sing a song they've never seen before in five minutes. *Information about what to expect if you purchase individual lessons or bundles of S-Cubed. The lessons are designed to unravel the mystery of teaching sight singing to your inexperienced middle school choir students. Click here to see the next freebie that is a Preview of what to expect from S-Cubed! Lesson 1! The Game! Click below to see the first paid product of S-Cubed! Get started today and get started on your journey of creating literate, competent sight singers out of your beginning middle school students! For the best value, click here and consider purchasing the full S-Cubed Program in one 27-lesson bundled set! Click here if you would like to check out the first five lessons offered in a bundle! Click here if you are considering buying Lessons 6-10 in one bundle! Click here if you are considering buying Lessons 11-15 in a 5-lesson bundle! Click here if you are considering buying Lessons 16-20 in a 5-lesson bundle! Click here if you are considering buying Lessons 21-27 in a bundle! It's more economical! Like me on Facebook for Flash Freebies and Special Deals! Subscribe to my YouTube Channel to see the latest teaching tips! Please +1 all of my products on Google Plus! Please rate my program and send feedback on my program on the TPT website! Contact me at dduncan158@gmail.com if you have any questions, concerns or need guidance in any way!